New! Brittany north coast ♦ (22 Côtes d'Armor) Small family campsite, 56 pitches, facing the sea on the Pink granite coast. No swimming pool, no organised activities, peace and calm are our priorities. New! Camping in Morbihan ♦ (56 Morbihan) In the forest of Pont Calleck a short distance from the river Scorff, this 37-pitch campsite welcomes you in a wonderful natural environment. A paradise for nature lovers. Le Balcon de la Baie - ♦ (35 Ille et Vilaine) , Quiet and wooded campsite between the Mont St Michel, Cancale and Saint Malo. The baker comes everyday and food trucks in summer. swimming pool, playgrounds and trampoline. WIFI throughout..
La Ferme de Croas Men - (29 - Finistère) ♦ In the countryside near Morlaix, close to the coast, a small rural campsite with 50 pitches spread over 2 hectares. Chalets & caravans for hire. Farm animals, ideal for families and nature-lovers. Small campsite near Loudeac + (22 - Côtes d'Armor) ♦ Small 6 pitch site with full amenities, located in a large tree lined and cut field, with ample space and privacy for campers. Near Guingamp (22 - Côtes d'Armor) * Riverside campite in wooded valley for the traditional camping experience. Firepits, raft building, fishing, woodland walks...perfect for young families. Stunning coastline 25 mins and easy drive to ferry ports.. Camping near Saint Lô (50 - Manche) ♦ Micro campsite with six pitches on tranquil small holding with chickens and sheep. Organic vegetable gardens. Home made bread, ice cream and more. Good facilities. Flat ground, 2km to local shops. Rural Normandy, 40 mins from Cherbourg (50 - Manche) ♦ Located in the countryside within easy walking or cycling of La-Haye-Du-Puits, small campsite is set in beautiful, peaceful surroundings. 6 pitches, 16 amp electric hookups. Toilets and shower block . Sandy beach 6 km at Bretteville-Sur-Ay. Central Cotentin (50 - Manche) ♦ Between Carentan and Lessay, CL style 6 pitch campsite. Each pitch has electric hook-up. Our site has toilet and shower facilities plus a chemical cassette drop point..
Omaha beach campsite (14 Calvados) Chalets for hire in this quiet Normandy campsite ten minutes from Omaha beach. Covered pool. Orne, Lower Normandy, Perche valley, (61 - Orne) Small campsite - English spoken - with twenty pitches set around its orchards and its own fishing lake 4 hours from Calais, 2.5 hours from Dieppe. Wi-Fi connection available on some pitches. Campsites listed on Rural-Camping.com are entirely independent of the directory. To be listed in the directory, campsites must meet the Rural-Camping.com selection criteria for size, environment and location, and must provide full information on a well illustrated website. Information presented here or on external links is the individual responsibility of the owner of the campsite, and Rural-Camping.com can under no circumstances be held liable for errors, omissions or misleading information. Recommend a good and calm independent campsite in France, Spain, Italy or the UK. If you run or have stayed in a small independent campsite that you think ought to be in this directory, contact Rural-camping.com with details. These two regions make up the northwest corner of France; they enjoy an Atlantic climate, meaning that they are relatively mild in Summer, and not too cold in winter, specifically in the coastal areas. Brittany and Normandy are popular for cycling holidays, since they are easy to reach. For more regional information, visit the Brittany and Normandy pages on About-France. com. 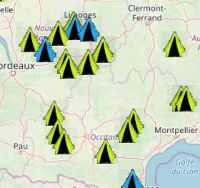 Most campsites in France are only open for a limited season. Outside of this period, reasonably cheap and convivial accommodation is available in independent hotels in Brittany or Normandy, or bed and breakfast accommodation. For longer stays, an excellent solution offering great value for money is to choose a gite or holiday cotttage. Check out gites in Brittany or gites in Normandy, since many gite owners offer highly discounted rates outside the main summer holiday period. 4. 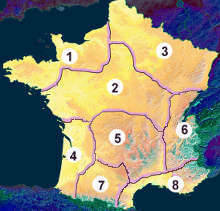 Southwest / Sud-ouest , Poitou-Charentes, Aquitaine etc.